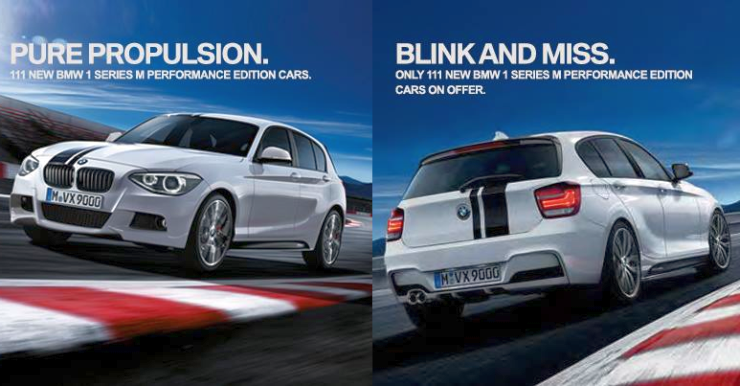 In what looks like a counter to Mercedes Benz’s recently launched Edition1 A and B-Class hatchbacks, BMW India has just introduced the 1-Series M Performance Edition. The M Performance BMW 1-Series hatchback will be limited to a run of 111 units for India, in a move that underlines exclusivity. The M Performance job is limited to the cosmetics though as both the petrol and diesel variants of the 1-Series hatchback sold in India retain their current crop of engines. The petrol motor is a 1.6 liter-4 cylinder, turbocharged unit that outputs 136 Bhp of peak power and 220 Nm of peak torque. The diesel motor is a 2 liter-4 cylinder, turbocharged unit that is good for 143 Bhp and 320 Nm. Both engines drive the rear wheels of the hatchback by means of an 8 speed automatic gearbox. The 1-Series is the least priced car in BMW India’s product range, serving as an affordable luxury car aimed at attracting younger and first time buyers to the German luxury label’s fold. However, the 1-Series – available in 4 variants – trails behind the Mercedes Benz A-Class in terms of sales. Equipped with a pure hydraulic sterring and a rear wheel drive layout, the 1-Series offers a sublime driving feel, head and shoulders above that offered by its rival with the three pointed star. However, steep pricing and plain looks have pulled the 1-Series down in terms of capturing eyeballs and purse strings. To turn the 1-Series around, BMW will need more than just a M Performance Edition, which from the looks of it, is a move to deplete accumulated stock. The 1-Series hatchback is assembled in India through the CKD kit route, at BMW’s Chennai factory. Ex-showroom Delhi prices of the hatchback start at 22.65 lakh rupees, going all the way up to 32.5 lakh rupees.